In the early 1930s, Italy was a world leader in aviation and had developed both liquid-cooled and air-cooled engines. In 1933, the Italian Air Ministry decided to focus on air-cooled radial engines, and the development of liquid-cooled inline engines was essentially abandoned. By 1939, the shortsightedness of this decision became clear as most premiere frontline fighters from Britain, France, Germany, the Soviet Union, and the United States were powered by liquid-cooled engines. As a result, the Ministero dell’Aeronautica (Italian Air Ministry) began to encourage the development of liquid-cooled engines. The FIAT A.38 RC15-45 was a 2,118 cu in (34.7 L) inverted V-16. The supercharger was mounted between the cylinder banks to decrease the engine’s length. Note the magnetos and contra-rotating propeller shafts. In 1939, the Italian Air Ministry asked FIAT to design a new aircraft engine to power the next generation of Italian fighter aircraft. FIAT engineers Antonio Fessia and Carlo Bona began designing the new engine, designated A.38. The A.38 was initially an upright V-16 engine closely based on the FIAT AS.8, which was originally designed to set speed records. While the AS.8 had individual cylinders, the A.38 used two cast cylinder blocks. After the initial upright engine design, the Italian Air Ministry was inspired by the German Daimler-Benz 600 series of inverted V-12s and requested the A.38’s configuration be changed to an inverted engine. Fessia completely redesigned the A.38, leaving very little in common with the AS.8. The AS.8 engine was a 45 degree V-16 with a 5.51 in (140 mm) bore and stroke, and by 1940, the A.38 had become an inverted, 90 degree V-16 with a 5.43 in (138 mm) bore and a 5.71 in (145 mm) stroke. The A.38’s 16-cylinder arrangement was selected to maximize the engine’s power output while keeping its cylinder size and supercharger boost within known and reliable limits. However, a V-16 engine is very long, and its crankshaft is subject to torsional vibrations. To keep the engine’s length as short as possible, Fessia used a 90 degree cylinder bank arrangement and positioned the supercharger horizontally between the cylinder banks. This resulted in a rather complex supercharger drive. 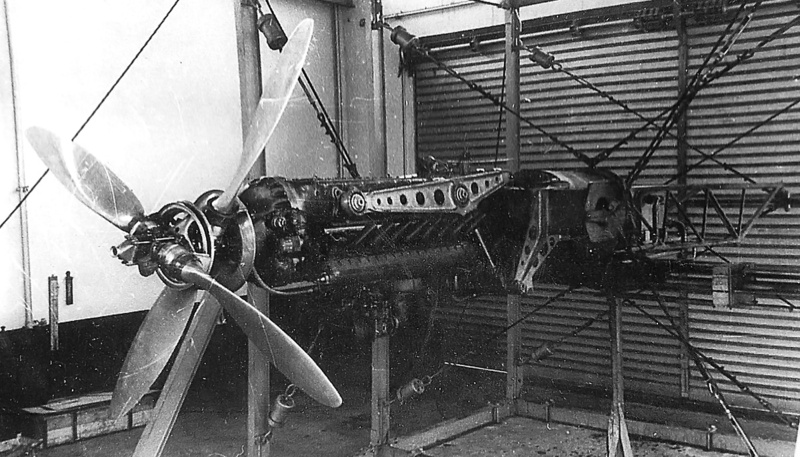 The AC.38 in a test cell. The supercharger arrangement greatly increased the engine’s otherwise small frontal area. The 1,200 hp (895 kW) engine could have sufficed with a single-rotation propeller, but the contra-rotating unit would eliminate asymmetrical torque. The A.38 was of all-aluminum construction with two detachable monobloc cylinder blocks. Each cylinder bank had eight cylinders, and each cylinder had two inlet and two exhaust valves. The valves were actuated by dual overhead (underhead in this case) camshafts that were driven by a single vertical shaft from the front of the engine. Two spark plugs were installed in each cylinder, and the spark plugs for each cylinder bank were fired by two magnetos driven at the front of the engine. The A.38 had a compression ratio of 7 to 1. The engine had contra-rotating propeller shafts that were driven at .514 engine speed. Between the cylinder banks were the carburetor, supercharger, intake manifolds, and water pump. There were plans to use fuel injection, but this was never completed. The single-stage supercharger had two-speeds that gave critical altitudes of 4,931 ft (1,500 m) and 14,764 ft (4,500 m). The supercharger was powered by a shaft driven from the front of the engine and situated in the Vee between the cylinders. This shaft also drove the oil and water pumps. The supercharger’s outlet was at the center of the engine, and the air was fed into four manifolds, each serving four cylinders. The engine was officially designated A.38 RC15-45: “RC” for Riduttore de giri (gear reduction) and Compressore (supercharged), and 15/45 for the altitudes (in hectometers) at which maximum power was obtained. The A.38 had a 5.43 in (138 mm) bore, a 5.71 in (145 mm) stroke, and a displacement of 2,118 cu in (34.7 L). The engine produced 1,200 hp (895 kW) at 2,800 rpm at 4,931 ft (1,500 m) and 14,764 ft (4,500 m). The 1,200 hp (895 kW) output was not normally enough to justify the use of contra-rotating propellers, but a photo of the engine in a test cell and a drawing of the FIAT G.55 fighter powered by the A.38 show propellers with just two-blades. It would appear that contra-rotating propellers were used more to eliminate asymmetrical torque than to compensate for exceeding the capabilities of a single-rotation propeller. The engine weighed 1,698 lb (770 kg). The FIAT G.55 fighter was originally designed to use the A.38 engine with contra-rotating propellers (top), but the aircraft was redesigned once the switch to a single-rotation propeller (bottom) was made. Delays with the A.38 led to the Daimler-Benz DB 605 being installed in the G.55. Three A.38 engines were ordered, but it is not clear if all were built. The A.38 underwent tests in 1941 and was able to achieved 1,300 hp (969 kW), but even more power was desired. Some developmental changes to the engine included switching to a single-rotation propeller shaft. Trouble was experienced with the engine’s crankshaft and supercharger drive, and despite multiple attempts, the engine failed to pass airworthy certification tests. Fessia continued to work on the engine into 1942, but the Italian Air Ministry had already obtained licenses to produce Daimler-Benz engines and was no longer interested in the A.38—FIAT would build the DB 605 as the RA 1050 Tifone (Typhoon). It is interesting to note that the AS.8 had proven itself reliable and probably would have been a faster and better starting point for Fessia than an all-new engine design. 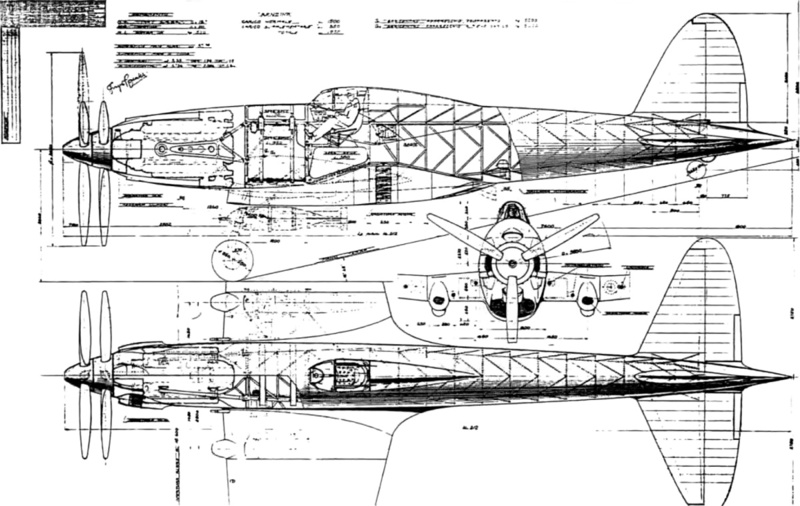 A number of aircraft designs were made to accommodate the A.38 engine. The only design that was actually built was the G.55. The G.55 was originally planned to be powered by the A.38 turning contra-rotating propellers, but the design was later altered for a single-rotation, three-blade propeller. In late 1941, it became obvious that the G.55 airframe would be completed before the A.38 engine was cleared for flight tests. As a result, a change to the DB 605 engine was initiated. First flown on 30 April 1942, the G.55 arguably became the best Italian fighter of World War II. Due to the state of the Italian aircraft industry in wartime, the G.55 was never made in sufficient numbers to have any impact on the conflict. The FIAT A.40 was a 2,000 hp (1,491 kW) X-24 that had the same bore and stroke as the A.38. Although two A.40 engines were built, they were never tested because of shifting priorities during World War II. Note the cannon installed in the upper Vee on the side view drawing. In 1940, Fessia tasked Dante Giacosa to create a new engine to compete with the A.38 and produce 2,000 hp (1,491 kW) at 8,202 ft (2,500 m). Instead of the V-16 layout, Giacosa turned to an X-24 configuration with four six-cylinder banks positioned 90 degrees from each other. The X-24 engine was designated A.40 RC20-60, and it used the same 5.43 in (138 mm) bore and 5.71 in (145 mm) stroke as the A.38. The A.40 engine had a single crankshaft and used one master connecting rod with three articulated connecting rods for each row of cylinders. The induction manifold was installed in the Vee between the lower cylinder banks and fed the two-speed supercharger mounted at the rear of the engine. The A.40 used a fuel injection system that Giacosa and his team had designed. The gear reduction unit raised the single-rotation propeller shaft, which enabled a 20 mm or 37 mm cannon to be fitted in the Vee between the upper cylinder banks and to fire through the propeller hub. The A.40 displaced 3,176 cu in (52.1 L), and an output of 2,000 hp (1,491 kW) was expected at 6,562 ft (2,000 m) and 26,247 ft (6,000 m). Reportedly, two A.40 engines were built in 1943, but Italy’s surrender prevented the engines from ever being tested. No information has been found on the disposition of any A.38 or A.40 engines. While Fessia was working on the A.38, he also designed a more powerful engine. There is some evidence that suggests the engine was originally designated A.42 and used four A.38 cylinder blocks in an H-32 configuration. However, the engine was redesigned and redesignated A.44 RC15-45. 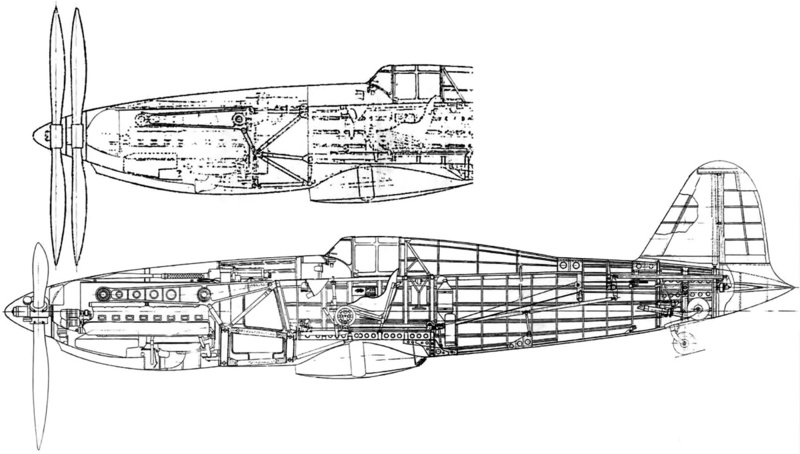 The FIAT A.44 was comprised of two V-16 engines stacked together to form an X configuration. The V-16 engine sections were independent of each other, and each section powered half of the A.44’s contra-rotating propeller at a .429 reduction. A.38 cylinder blocks, pistons, and crankshafts were used, but the V-16 engine sections had a wider bank angle of 135 degrees. The X-32 engine displaced 4,235 cu in (69.4 L) and was forecasted to produce 2,400 hp (1,790 kW) at 2,800 rpm and a maximum of 2,800 hp (2,088 kW) at 2,950 rpm. The engine was estimated to weigh 3,307 lb (1,500 kg), and the design progressed through 1942. While FIAT designed a few aircraft to be powered by the A.44, like the CR.44 fighter/bomber and the BR.44 torpedo bomber, the engine failed to gain the support of the Italian Air Ministry and was never built. The FIAT CR.44 fighter/bomber was planned around the 2,400 hp (1,790 kW) FIAT A.44 engine. The A.44 X-32 engine was essentially two V-16 engines mounted together. The A.44 engine would have shared most parts with the A.38, except the crankcase. Neither the A.44 nor the CR.44 were built. This entry was posted in Aircraft Engines, World War II on 5 January 2017 by William Pearce. Another outstanding brief on an otherwise unknown effort. Keep up the good work! Hello Frank – Thank you for your kind words! Gotta love those Italian engine designs. So creative!